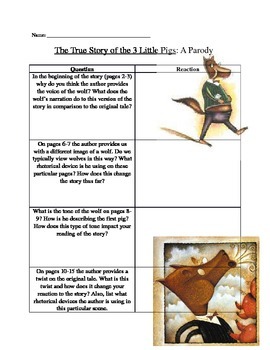 Teaching Parody using the book "The True Story of the Three Little Pigs"
During a satire and parody unit that I teach in 10th grade English, I use the children's book "The True Story of the 3 Little Pigs" by Jon Scieszka to help my students understand the idea of parody and the rhetorical devices used in it. I first have the students read over the original telling of the tale and then within their groups they read the parody version. 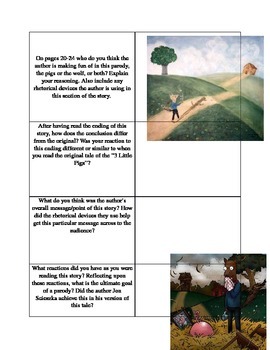 As they are reading the version they complete this guide-o-rama handout to guide them in recognizing the key aspects of a parody and the message that it promotes.